Hi friends! Letting you know that this post is sponsored by The Little Potato Company. Thanks for supporting brands that make DK possible. 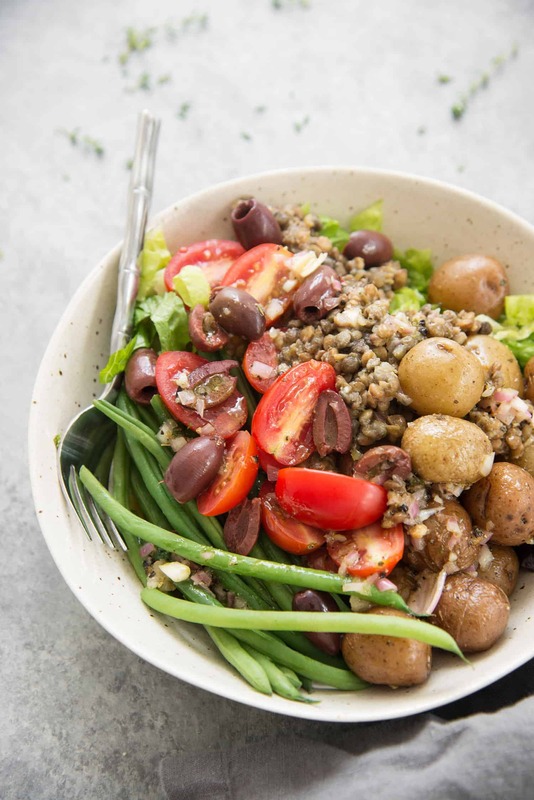 Here’s my vegan and gluten-free version of the classic niçoise salad. Though, I suppose if I’m not using tuna or hard boiled eggs I can’t really call it a classic. Doesn’t matter to me. This version is just as, if not better, than the traditional. 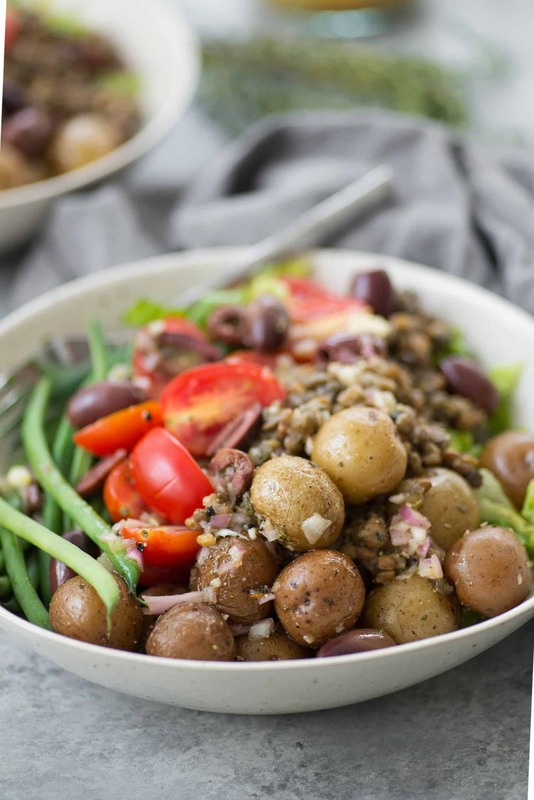 You’ve still got the creamy addition of baby potatoes, crisp green beans, salty niçoise olives, hearty lentils and lots of tangy shallot dressing. Gosh. I could eat this salad almost daily and not get tired of it. 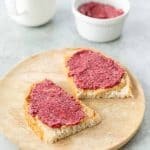 There are so many wonderful ingredients that complement each other perfectly; all tucked into a satiating and fiber-rich meal. Want the most delicious niçoise salad? Then don’t worry about arranging each ingredient on the salad plate. Yes, I know how much that makes Instagram happy, but a salad should be well-dressed and tossed together so that you get all those yummy flavors in each bite. A bit of briny olives, creamy potatoes, tender green beans, juicy tomatoes… you know where I’m going with this. As much as I love the look of a composed salad, I hate eating them that way. And for a niçoise salad, I think that’s an absolute must. 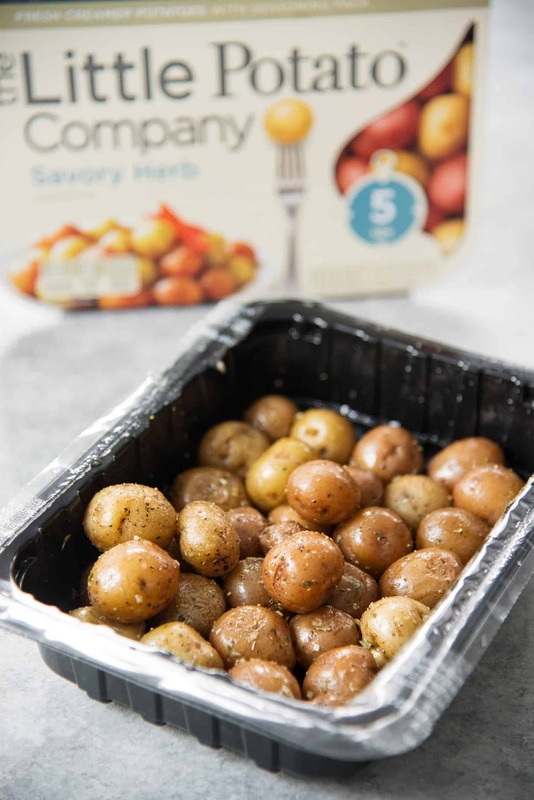 These microwave-ready Savory Herb potatoes from The Little Potato Company are perfect in this salad. Open them up, throw them in the microwave with a little oil and seasoning packet and they are ready in just 5 minutes. Small and creamy, they are the perfect size for this salad. I don’t even slice ’em in half, just enjoy them whole. 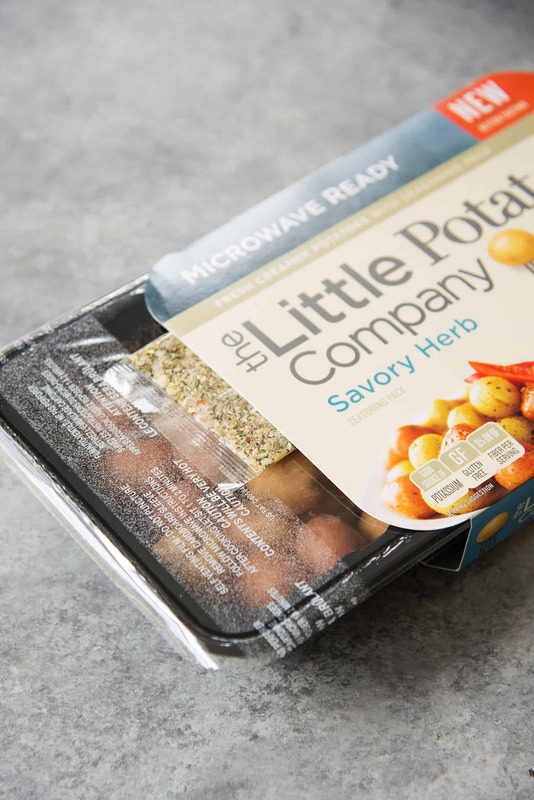 That’s the real beauty of The Little Potato Company– the creamer potatoes come pre-washed and in the microwave-ready version, practically ready to go. I love that I can have a healthy side-dish (or salad component) in just 5 minutes. The savory herb seasoning packet also makes for a great dressing base. Use half to cook the potatoes, then save the other half for making the shallot dressing. Since the potatoes are so easy, I kept the rest of the ingredients easy as well. I’m using pre-steamed lentils that I picked up from the produce section of the grocery store along with fresh, steam-able green beans. I rarely spend the extra money on ready-to-go produce and lentils like this, but I wanted a salad that could come together quickly. While I love lentils, I don’t always have the 45 minutes needed to cook and then cool them. 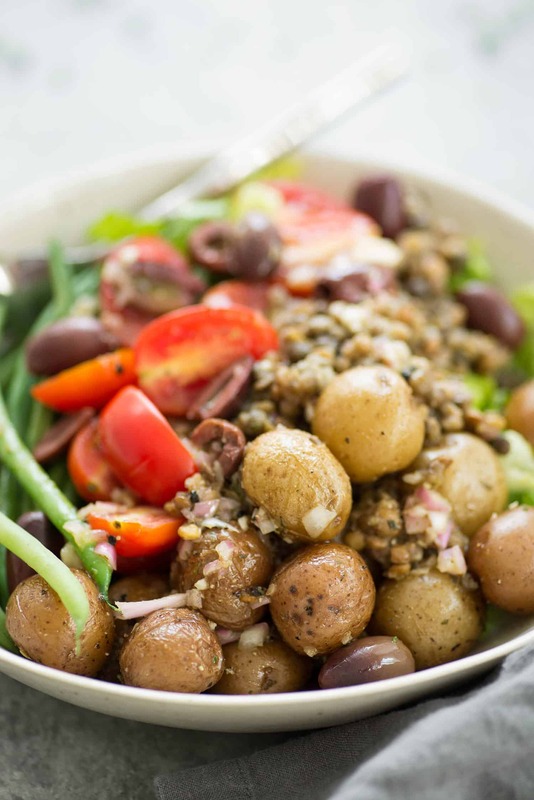 Pre-steamed lentils are perfect for salads like this, and still an inexpensive source of plant-based proteins. 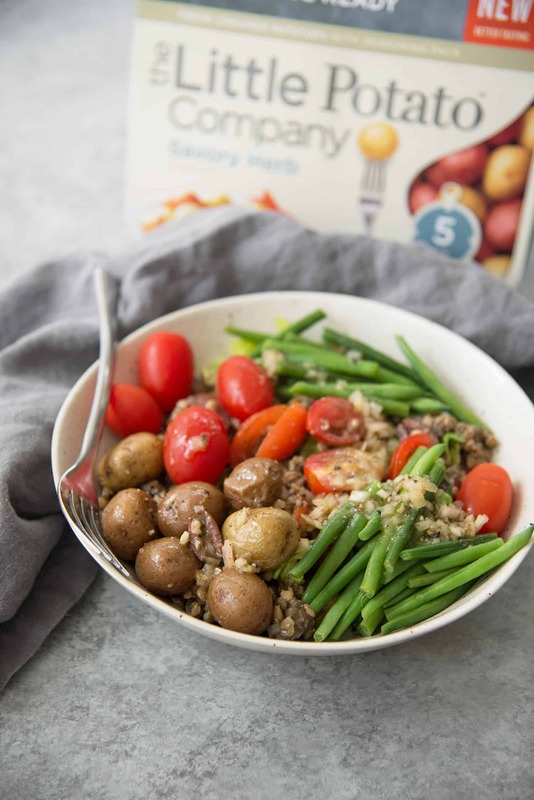 If you can’t find pre-steamed lentils or steam-ready green beans, then just use regular and cook your own lentils. This salad is also an easy on to add to meal-prep menus; make all of the ingredients ahead of time, then assemble when ready to eat. Remove the packaging from the potatoes and toss with 1 teaspoon olive oil and 1 teaspoon seasoning packet. Place in the microwave and cook for 5 minutes. 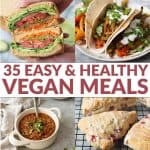 Remove from the microwave and set aside. 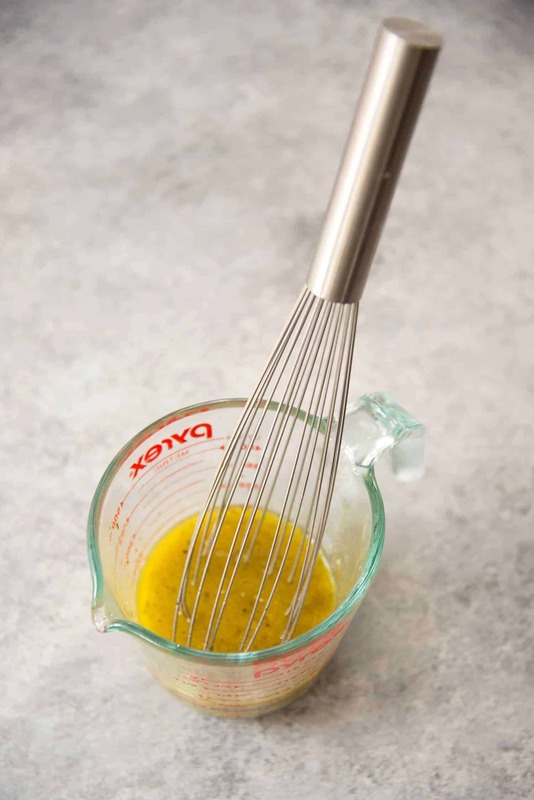 Whisk together the shallots, dijon, red wine vinegar, salt, pepper, olive oil and 1 teaspoon of the savory herb mixture from the potatoes. Set aside. To make this come together quickly, I use pre-steamed lentils. You can find these in the refrigerated produce section in the grocery store.